I am honored to donate this painting. I made this piece especially for the fifth installment of "Art Project Los Angeles". The auction benefiting "Aids Project LA" will take place this Evening June 6, 2015 at The Bonhams Auction House. The painting titled "Dream Code" represents my hopes and dreams that we soon solve the last few pieces of this Enigma. Please join me in supporting this cause. Mark Lorenzetto does not need a strong introduction: his works speak for him and for us. As every real artist he touches our emotions and our imagination. 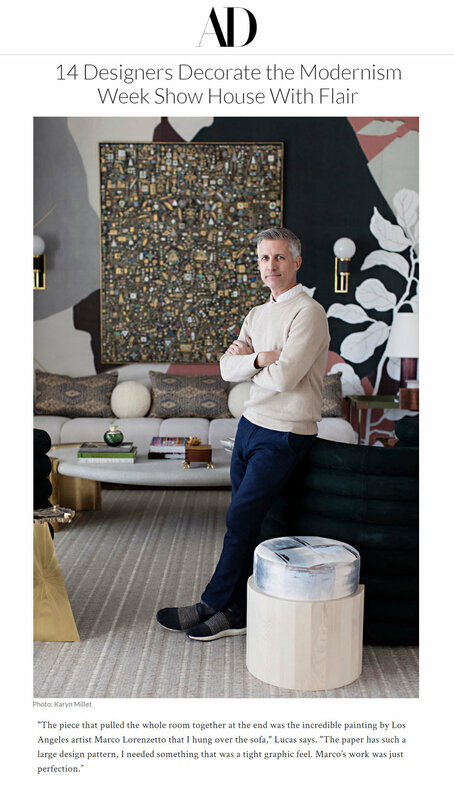 His work is anchored in Art History and in Modern vogue, at the same time. 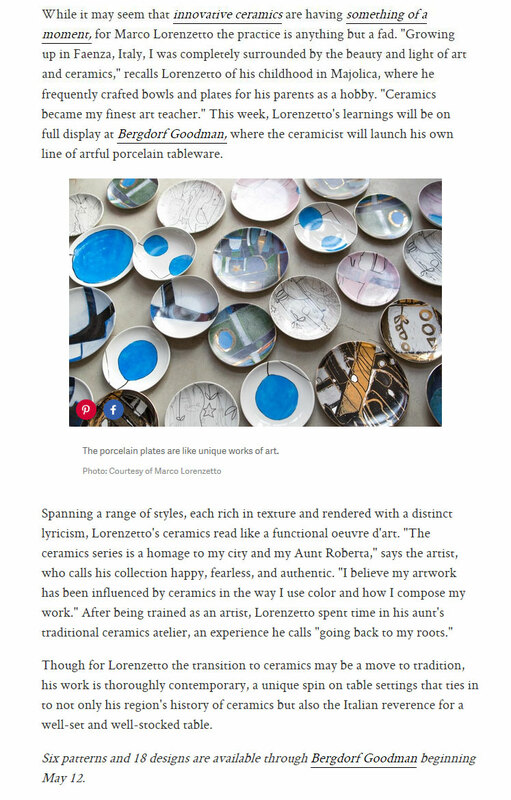 As an Art Historian (at the New School University), executive director of the American Friends of the Warburg Institute and the author of Obsessed by Art, the Life and the Legacy of Aby Warburg (Random House, 2008), I recognized Lorenzetto’s talent immediately and I do believe in his present and future success.As an Italian for birth, I think that America can offer him better opportunities and deserves his vibrant creativity. His tangible images, his sensual use of colors, his minimalistic irony is a mixture of what “Art” should be, today. I strongly recommend Mark Lorenzetto for an immediate recognition. I lavori recenti di Mark Lorenzetto rappresentano la somma dei piu’ importanti elementi estetici: creatività’, competenza tecnica, un serio sense of humor ma, soprattutto, poesia. La percezione di queste categorie permanenti, nella storia dell’arte, si fonde nell’innocenza della gioventù’ e nell’energia di un adulto che sa osare e sedurre. Nelle forme geometriche di Mark, cola libero il colore e nelle sue linee irregolari emerge chiara la disciplina e il metodo. Alcune rappresentazioni di Mark sono piu’ rigorose, altre piu’ evocative, come sogni ad occhi aperti, ma anche se queste immagini sono astratte, in senso postmoderno, mantengono la propria essenza nel vagabondare della fantasia. A volte, sembra che si possa “toccare” la sua arte: l’olio diventa un bassorilievo ed il colore una sfida oculare. Mark crede nella sua arte e convince lo spettatore a credervi altrettanto, cosi’ che gli stereotipi dell’arte contemporanea diventino pura genuinità’. Gallery Nikki Diana Marquardt, which was established more than twenty years ago and is one of Paris’ leading venues for contemporary art, is producing an exhibition of Mr. Lorenzetto’s work. With the opening of his exhibition at Gallery Nikki Diana Marquardt, Lorenzetto will join the ranks of some of the world’s most celebrated contemporary artists whom the Gallery has represented and exhibited, including (i) Dan Flavin, whose work has also been exhibited at the Musée d’Art Moderne de la Ville de Paris (Paris Museum of Modern Art), the National Gallery of Art in Washington, DC, and the Cooper- Hewitt National Design Museum in New York; (ii) Evelyne Ortlieb, whose work been shown at the Musée d’Art Moderne de la Ville de Paris, Musée de Grenoble, and 1988 Musée d’Arles; and (iii) Antoine Poupel, whose work is held in the permanent collections of Musée d'Art Moderne de la ville de Paris, Bibliothèque Nationale in Paris (National Library), and Musée de Dunkerque. Mark Lorenzetto is a uniquely gifted and skilled artist. At the very tender age of 24 years old he has already had a number of successful shows in Italy and in New York and came to me recommended by friends. I am inundated daily with such requests from artists and their agents. Mark Lorenzetto has had no formal fine arts training. His work however is refined, excruciatingly fresh and ever evolving reflecting the incredible energy and enthusiasm that emanates from this young man. He has very acute awareness of his potential and limitations.. He works continually to perfect and ameliorate his production…His work is a medley of colour and form of abstract gestual painting and also a very formalist line and shape oriented minimalist style. However different these styles might seem in the formal sense he rigorously masters both techniques and there is no half baked or ambivalent proposition in the resulting oeuvre. MARK LORENZETTO: the joy to live in the Abstract. “The indistinctness of the memory like a slow wave conveys with itself all the tastes of a season, but not its particularities, not even a shadow of a shadow, but only the infinite “negative” of those remembered forms, rather than the limited although undefined “positive”...” (AFRO TO LIONELLO VENTURI 1958). The alphabet of Mark Lorenzetto, is born with Abstractionism, the identification of the distances of emotion and the principles of perception of reality , reaching the definition of a language based on the expressive and symbolic function of color and on the rhythm produced from mutual relationships of pure forms. In the works that we are today presenting , and set in a moment consciously chosen by the artist, the “subject” of the non - objec- tive art is the inner being, surrendered, manifesting itself in the mysterious process of the subjective inspiration, thanks to the deep association of pure color and form in painting; all plunged into a rythmic scanning that is a prelude to the relationship of music and painting characteristic of the artist who is an excellent connoisseur of music. Inside of the composite space, the form, in expressing the deeper and private levels of knowledge of the artist, paradoxically discloses the truth of universal accessibility and connection and the hidden but revealing la joie de vivre. MARK LORENZETTO: la joie de vivre dans l’abstraction. "De la mémoire il reste les souvenirs indistincts, une vague lente qui traîne avec elle tout le goût des saisons, non pas ses formes tangibles, ni même l’ombre de l’ombre, mais seulement l’infini “négatif” de ces formes rappelées à la mémoire, toujours limitées alors que indéfinies “positif”..." (AFRO À LIONELLO VENTURI 1958). L’alphabet de Mark Lorenzetto, naît avec l’Abstraction, et l’identification des parcours de l’émotion et des principes de perception du réel et atteint la définition d’un langage basé sur la fonction expressive et symbolique de la couleur et sur le rythme produit par les interrelations entre les formes pures. Dans les travaux présentés aujourd’hui et choisis dans un moment de pleine conscience par l’artiste, le sujet de cet art “non-ob- jectif” est l’être intérieur “objectif” livré et rendu tangible au cours du processus mystérieux de l’inspiration subjective grâce à l’association de la couleur pure et de la forme dans la peinture. Le spectateur est immergé dans un ballet rythmique, prélude à la relation entre peinture et musique dont l’artiste est fin connaisseur. A l’intérieur de l’espace composé la forme évolue encore pour exprimer des niveaux de conscience plus profonds et privés de l’artiste, puis divulgue l’accessibilité des vérités universelles mais aussi paradoxalement des rapports plus cachés et imbriqués, mais toujours exaltant la Joie de vivre. MARK LORENZETTO: la gioia di vivere nell’Astratto. L’alfabeto di Mark Lorenzetto, nasce con l’Astrattismo, con l’identificazione dei percorsi dell’emozione e dei principi di percezione del reale, giungendo alla definizione di un linguaggio basato sulla funzione espressiva e simbolica del colore e sul ritmo prodotto da rapporti reciproci di forme pure. Nelle opere che oggi presentiamo, ed incentrate in un momento particolarmente intesodell’artista, il “soggetto” dell’arte non –oggettiva è l’essere interiore reso manifesto nel misterioso processo dell’ispirazione soggettiva, grazie alla profonda conoscenza del colore e della forma puri in pittura; il tutto immerso in una scansione ritmica che prelude al rapporto musica e pittura caratteristicodell’artista ottimo conoscitore della musica . All’interno dello spazio compositivola forma , nell’esprimere i livelli di consapevolezza più profondi e privati dell’artista, rivela paradossalmente verità di portata e attinenza universali ed una nascosta ma svelata gioia di vivere.